Are you looking for a way to add some flair to your annual Thanksgiving dinner? Consider incorporating a theme to your celebration to make it stand out and become an unforgettable event. If you want to spice up your traditional Thanksgiving celebration, switching up the decorations and food can turn it into something unexpected and spectacular. You can keep with the traditional feast of turkey, gravy and mashed potatoes and add in a few surprises to please your guests or do something totally different and surprising. Proper use of color can help any host set the mood of the party. 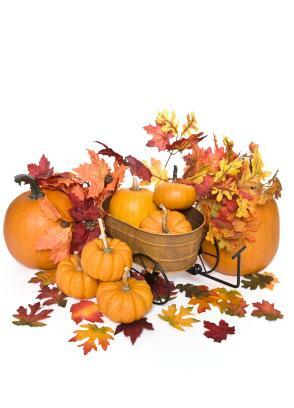 Thanksgiving themes can be started and brought together with good use of color. Autumn colors are warm, inviting and relaxing. They will help you set up a relaxed mood that will help your guests get in the holiday spirit and have fun. Perfect autumn colors are amber, brown, tan, burgundy or orange. Autumn Spice: Use a mix of hues of red and orange to create a spicy décor. Decorating with candles in cinnamon and spice scents can help set the mood. Add cinnamon sticks to drinks and serve a dessert to complement your theme such as spice cake. Going Green: Use environmentally-friendly paper products and incorporate a natural color theme to your Thanksgiving tablescape. Set up a recycling station for glass, cans and paper. Festive Fall: Rich colors represent fall. This means using hues of orange, brown and yellow to tie into the fall theme. Decorate with leaves and other fall embellishments to set the mood of the celebration. You can bring the great outdoors inside for your Thanksgiving celebration. This is easy to do. In addition to decorating with some colorful leaves and branches, set your dining area to resemble a picnic. Use a plaid tablecloth, paper plates and napkins and serve your meal buffet style where each guest can help themselves. Since Thanksgiving Day is filled with plenty of football games to watch, use a sports theme for your Thanksgiving celebration. You can still serve the traditional dinner but add a few creative twists such as decorating the table in your favorite team's colors. Allow guests to watch the games while enjoying the meal and cheering on the home team as part of the day's festivities. For an added touch, ask your guests to wear a football- themed jersey. Decorate your table in a fusion style that can incorporate a variety of cultures. Play international music and have each guest describe a bit about the culture they are representing while enjoying the delicious offerings from around the world. If you have a lot of kids coming to celebration, focus the day around them. This will make it fun for the kids and easier on the parents. Set up an area with arts and crafts for the kids. Include projects such as Thanksgiving coloring pages and turkey cut-outs that be decorated and used for the celebration. You can also have your own holiday parade and have the kids march around the room showing off their Thanksgiving creations. The menu can be kid-friendly and include items such as macaroni and cheese, mashed potatoes, turkey sandwiches and mini apple pies. For a special twist, bake a batch of cookies in the shape of turkeys and allow each child to decorate them for dessert. There are many activities that can keep both kids and adults busy and active on Thanksgiving. Taking a walk outside after the big meal or playing a board game in the family room are great ways to pass the time and bond together as a family. A Thanksgiving dinner party can be a great way to bring friends and family together. Turn your traditional Thanksgiving celebration into a formal affair by asking guests to dress in their best attire. Serve the traditional dinner on fine china and use your best table linens. Accent the room with candles and soft music and hand each guest a glass of champagne as they arrive to your celebration. After you settle on a Thanksgiving theme, carry it throughout your entire party. If you send out invitations, give your guests a clue about the theme on the invite. Decorations, food and activities can all tie into the theme as well. A theme is a great way to spice up your celebration and turn the day into an unforgettable celebration.